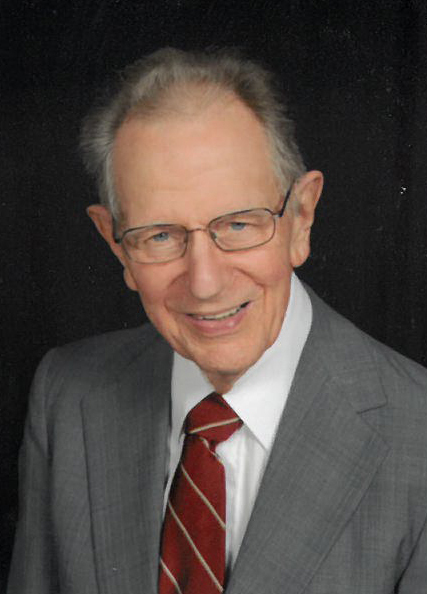 Obituary for John Hamer | McKee Mortuary Inc.
Dr. John L. Hamer M.D., age 95 died on January 15, 2019 at Timbercrest Senior Living Community, North Manchester IN. He was born in 1923, in Waterloo, Iowa, to parents O. Stuart Hamer, PhD, and Gertrude (Sharp) Hamer. In his youth, the family, including an older brother named Vaughn, moved to North Manchester, IN; where John enjoyed working with other youth in the community and serving on the Middle Indiana Youth Cabinet. In these years of his life, John was influenced by such church leaders as Dan West, H.L. Hartsough then pastor of the Manchester Church of the Brethren, as well as former missionary to Nigeria, Desmond Bittinger. Their teachings and inspiration impacted John’s life that promoted “peace” as one of John’s primary focus within his life. John attended school in North Manchester and graduated from Central High School in 1941 and then earned a degree in Chemistry and Pre-Med from Manchester College. John received his M.D. degree from Case Western Reserve University in Cleveland, OH. It was there that he met the love of his life Esther Rinehart, from Hagerstown, IN who was also attending Case Western Reserve University in the School of Nursing. After earning his M.D., John and Esther were married on June 28, 1952 in Hagerstown, IN, at the Nettle Creek Church of the Brethren. In 1953, both John and Esther went to Nigeria, where they both performed Medical/Nursing work for 16 years. In addition to his medical work, John was also an ordained minister and elder in the Church of the Brethren and an active participant in the ministry and mission work at Lassa. During the end of their period of work at the hospital in Lassa, a co-working nurse became very ill. After various treatments, lab tests and critical evaluations, John believed strongly that they had discovered a new viral disease. Upon the death of the nurse, John insisted with great persistence, and samples of blood and other specimens were sent to the CDC, Atlanta GA, and the Yale Arbovirus Research Labs, at Yale University for further research. This led to the confirmation of John’s discovery, and the deadly viral disease was then named Lassa Fever. Upon returning from Nigeria in 1969, John joined a group family practice in LaGrange, IN, and then had his own family practice of 18 years in Fort Wayne, IN. John was the first hospice physician when the Parkview Hospital Hospice Program began. John performed additional work at the Fort Wayne State Development Center for 10 years. During their time in Fort Wayne and up to the present, they are members of Beacon Heights Church of the Brethren. In 1989, both John and his wife Esther, received Manchester College Alumni Honor awards and John was recognized by the State of Indiana Medical Association for 50 years as a practicing physician. Dr. John Hamer’s work was based on his wanting peace and reconciliation for all. John & Esther both loved to travel and their journeys took them throughout the United States, including Alaska and the islands of Hawaii, also to China, Russia, Egypt, the Middle East, and much of Europe. John also enjoyed the hobby of collecting postage stamps. John will be forever remembered by his wife, Esther Hamer, North Manchester and two daughters, Dr. Harriet Hamer (Abram Bergen), South Bend IN and Krista Hamer-Schweer (Thomas Schweer), Colbe, Germany. Step grandchildren: Jeremy Bergen (Rebecca Steinmann) Waterloo, Ontario Canada; Rachel Bergen (Hector Argueta), Winnipeg, Manitoba Canada. Step great grandchildren: Seth and Eli Bergen; Hazel and Coco Argueta. Also by nieces and nephews, David, Sylvia, Kevin and Janice Hamer. He was preceded in death by his parents, brother Vaughn Hamer (Marcia), and nephew Robin Hamer. A Memorial Service will take place at Timbercrest Chapel, 2201 East Street, North Manchester on Saturday February 9, 2019 at 1:15 p.m. with Visitation to follow. Visitation will also take place on Sunday February 10, 2019 at 1:00 – 4:00 p.m. at Beacon Heights Church of the Brethren, 2810 Beacon St. Fort Wayne. Pastors Brian Flory and Karen Eberly will officiate. Burial will be Oaklawn Cemetery, North Manchester IN. In lieu of flowers, preferred Memorials are: to the John L. and Esther L. Rinehart Hamer Endowed Professorship in Music at Manchester University; Timbercrest Senior Living Community, or Beacon Heights Church of the Brethren.